I have a really strange behavior in an iOS App. I switched from iOS 6 to iOS 7. In iOS 6 everything worked perfectly. 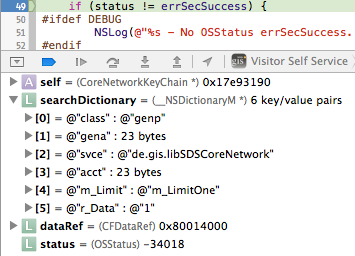 When the App starts the - (NSData *)searchKeychainCopyMatching:(NSString *)identifier function loads the values from the keychain. Everything works fine for a while. But after about 15 successful value requests I get an error. @result A result code. See "Security Error Codes" (SecBase.h). But looking in the SecBase.h there are only these OSStatus codes specified. The values doesn't get overridden, already checked. I was debugging the whole day and I found some news. I'm downloading a Zip-File containing an executable Bundle. This is a In-House App so no worries about point 2.7 and 2.8 in the review guidelines. After successfully loading the bundle the entitlements error appears. Well the bundle code inside does not use the keychain. May be this is some kind of security logic? Any clues? This error indicates a problem with your app's entitlements. Found this: The cause is often that the App Identifier Prefix in the app's entitlements doesn't match the App Identifier Prefix in the provisioning profile. Not the answer you're looking for? Browse other questions tagged ios iphone security or ask your own question. How to include Client Certificate with ASIHTTPRequest?